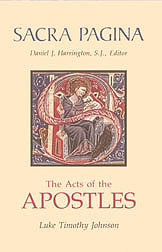 The Acts of the Apostles is really the second volume in the two-part writing scholars call Luke-Acts. It continues the story begun in the Gospel of Luke, showing how the Good News offered by Jesus to the outcast of the people was eventually extended "to the end of the earth," so that Gentiles as well as Jews came to share in the blessings of God. This commentary treats Luke-Acts as an apologetic history. It takes with equal seriousness both Luke's literary artistry and his historical interests, fitting his methods comfortably within the ancient standards of historiography. This perspective illustrates in particular that Luke's historical narrative serves a definite religious intent. Tracing that intent through the specific contours of Luke's story is the special contribution of this commentary. "I rejoice in recommending one of the most gracefully erudite, historically astute, and theologically rewarding commentaries available in a frugal market." "This is an excellent commentary and a very important contribution in the series." The expression "Sacra Pagina" ("Sacred Page") originally referred to the text of Scripture. In the Middle Ages it also described the study of Scripture to which the interpreter brought the tools of grammar, rhetoric, dialectic, and philosophy. This series presents fresh translations and modern expositions of all the books of the New Testament. Written by an international team of Catholic biblical scholars, it is intended for biblical professionals, graduate students, theologians, clergy, and religious educators. The volumes present basic introductory information and close exposition, with each author adopting a specific methodology while maintaining a focus on the issues raised by the New Testament compositions themselves. The goal of Sacra Pagina is to provide sound, critical analysis without any loss of sensitivity to religious meaning. This series is therefore catholic in two senses of the word: inclusive in its methods and perspectives, and shaped by the context of the Catholic tradition. The Second Vatican Council described the study of "the sacred page" as the "very soul of sacred theology" (Dei Verbum 24). The volumes in this series illustrate how Catholic scholars contribute to the council's call to provide access to Sacred Scripture for all the Christian faithful. Rather than pretending to say the final word on any text, these volumes seek to open up the riches of the New Testament and to invite as many people as possible to study seriously the "sacred page."